The General Settings let you change many of the items that control how your blog is displayed, such as the title, tagline, timezone, and date/time formats. 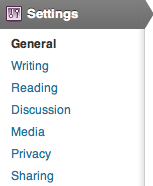 Click Settings from the left hand menu in your Dashboard to access these settings. The first setting you will see is Site Title. The Site Title is displayed in the title bar of a web browser and is displayed in the header for most themes. Now that WordPress has been installed, do not touch the values in these fields unless you are specifically instructed to do so in the documentation or instructions for a site move. Changing these values without carrying out the proper steps in the correct order will stop your site from working correctly and make it impossible for you to login to correct the problem. The Email Address is where all comment moderation emails are sent. This can be different from the email address used for blog activity notifications by plugins. The Date Format lets you select how dates will be displayed on your blog. Several popular choices are available, as well as a custom option. Time formatting uses PHP standard format, which can be confusing. You can review Formatting Date and Time, which explains the code.